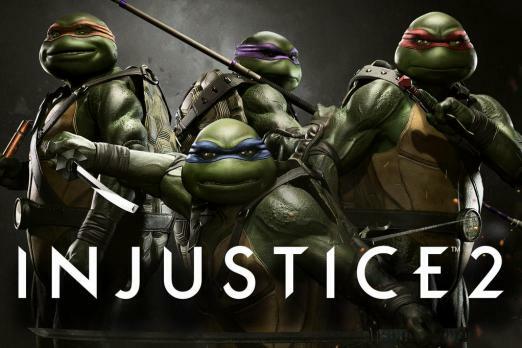 The day has come for Injustice 2 players to download and play as Leonardo, Donatello, Michelangelo and Raphael, the Teenage Mutant Ninja Turtles. Since their reveal late last year, their release has been highly anticipated. Now that Atom and Enchantress have made their way to the game, it’s time to see what the turtles in a half shell can do against Batman, Superman and the rest of the DCU. The Teenage Mutant Ninja Turtles release for those with the Injustice 2: Ultimate Edition or who purchased the season pass will have access to the TMNT on Feb. 13. Those looking to purchase them separately will have to wait a week. Normally, DLC characters appear in console stores in the late morning/early afternoon hours, so if the TMNT are not visible you may have to wait a little while longer. Although Injustice 2 DLC characters are relatively easy to download, finding them in the PSN or Microsoft store can be tedious. Here’s what you need to know to to download the Teenage Mutant Ninja Turtles onto Injustice 2 for PS4 and Xbox One. Visit the Injustice 2 page on the PS4 Home Menu or Game Library. Select the game and scroll down to the "Related Items" section at the bottom. It should be under PlayStation Store at the bottom. From the My Add-ons section, manually download individual pieces of owned content. Players who own the Ultimate Edition, Deluxe Edition or Fighter Pack 3 can also click “View All” to see store options. The DLC should be available for “Free” if it has not been downloaded. Locate Injustice 2 and press Menu. Allow the game to Idle for a minute or two, long enough for an AI battle to automatically start. Once the AI battle has started, you can interrupt it by pressing any button. Enchantress should now be available to play if you own the DLC. Go into the online menu for a few moments, then return to the main menu. Teenage Mutant Ninja Turtles should be available to play. Were you able to find and download Teenage Mutant Ninja Turtles for Injustice 2? What are your impressions of the new fighters? Let us know in the comments section below.